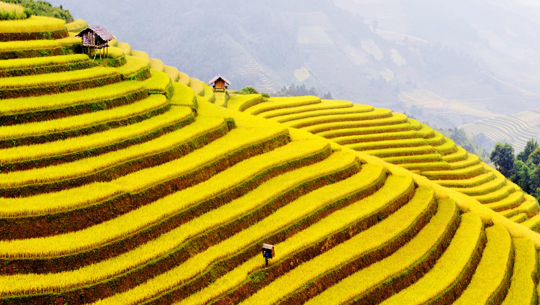 Surrounding Sapa are the Hoang Lien Mountains, which the French nicknamed the Tonkinese Alps. These mountains include Fansipan, which at 3143 metres is Vietnam’s highest. – In day 2, if you do not want to attend the long trek Y Linh Ho – Lao Chai – Ta Van, our tour leader will help you visit another place. All tickets and transportation fees are paid by you. – Due to altitude of Sapa, it is sometimes foggy in December, January, February and March. – Trekking shoes, sun glasses, sun cream, insect repellent are also necessary. You should take cash with you in Vietnam Dong because banking system in Sapa sometimes doesn’t function well. US Dollar, Euro, Australia Dollar are accepted in Sapa. – You should take medicine with you although there are some chemist’s shops in Sapa in case you get sick.